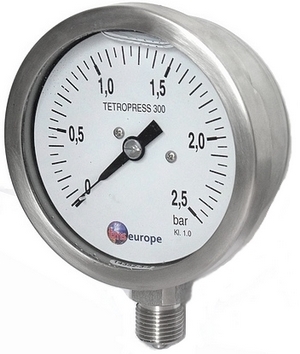 The TP300 is a 1.6% accuracy pressure gauge 0-2.5 bar, supplied UKAS calibrated at 5 points across the range. The all stainless steel industrial pressure gauge is for onshore and offshore applications, on chemical and petrochemical plants, pharmaceuticals, food, machinery and processing industries. A range of other types of gauge available, contact us for a quote.